Zapatista compañeras and compañeros from the bases of support of the Zapatista Army for National Liberation. Compañeras, compañeroas, and compañeros from the National and International Sixth. Sisters and brothers from Mexico and the world. We greet the family of compañero Luis Villoro. Welcome to the rebel lands that struggle and resist in Zapatista territory. It is an honor to have you with us, the Zapatista bases of support from the five zones. 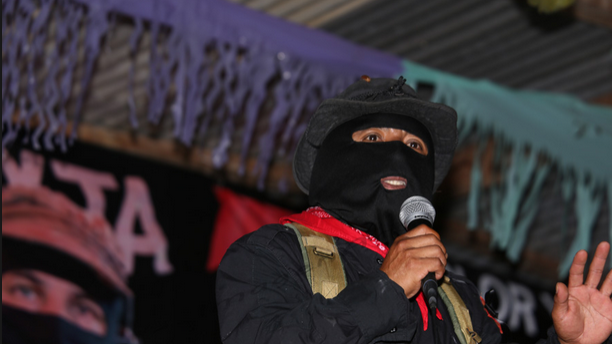 Greetings to the family of Zapatista teacher, compañero Galeano. Receive our embrace, compañeros and compañeras of the family of compañero Galeano, and of the family ofcompañero Luis Villoro. We should honor, and know how honor, those who deserve it for the mission fulfilled by the compañerosGaleano and Luis Villoro. Compañeros, compañeras, and compañeroas, brothers and sisters, we are here today not to remember how much we miss the physical existence of the compañeros Galeano and Luis Villoro. We come here to remember and to talk about the struggle they waged in lives and in their work, the resistance struggles they were part of. We did not come here to remember death, but to remember what they gave life to through their lives of work and struggle, and what we must do to keep those lives of work and struggle alive. It is we who have to make it so that those who give their lives for a new world, one created by the people, live forever. We are not here to raise a statue. A statue will not provide life, a museum will not give life; they do not speak. We are those ones who speak. We are the ones who have to keep them alive and in this way, create a statue and a museum that will live in our hearts for generations, rather than remaining mere symbols. We were very happy that we were able to hear more about the life of the Zapatista compañero Don Luis Villoro, who in other places is known as a theorist and who here we know as a practitioner; who in other places is known as a philosopher, and who here we know as a Zapatista. To those who were by his side in struggle and in work, to those who worked with him, we give our thanks because they told us more about him, about the other facets of his life. So we Zapatistas will tell you about another facet of his life. For example, thanks to the compañero Luis Villoro and others like him, we have clinics and schools for Zapatista education. That came from his efforts, from his work. But that in itself is not enough. People were needed to build, people like compa Galeano, and people needed to work as promotoras to launch their dreams there and then organize for what the students would need. And that was what compañero Galeano constructed, worked on, and got moving. This is how the Zapatista people are organized. This is how the compa Galeano came to be a teacher, thanks to the help of compa Luis Villoro and others like him. He respected us, and we respected him. He treated us as equals. He believed in us and we believed in him. We came to work on the same project without seeing each other physically, that is, one can contribute to constructing something without personally being there. This is how, for example, the Sixth all over the world worked to construct the school and clinic in the Zapatista community La Realidad, over the blood of our compañero Galeano. The compas Luis Villoro and Galeano did not know each other, but nonetheless they were together, constructing the same freedom. We also heard about facets of compa Galeano’s life of struggle. First he decided to struggle, and later he received support, and then he organized to for the actual construction, and then organized those who would be promotores, and finally he oversaw what the students would need. Because the compa Galeano was and is a miliciano, a corporal, and later a sergeant. He was regional representative of the youth, member of the MAREZ (Zapatista Autonomous Municipality in Rebellion), teacher of the Zapatista Little School, and member-elect of the Good Government Council. Because one needs to organize in order to LIBERATE oneself from the capitalist system. Because only the people will liberate themselves, no one will give them their freedom; no leader, man or woman, will bring freedom. Because the capitalists are not going to give up or repent and stop exploiting the people. Because the capitalist system cannot be humanized. In order to put an end to the system, it must be destroyed, and to do that, one must organize. Compa Luis Villoro saw that this is what the Zapatistas were doing and he did not think twice about accompanying us, in struggling and working and supporting the struggle and the organization that the life ofcompa Galeano represents. Hopefully there will be more Luises, Luisas, and Luisoas, Villoros, Villoras, and Villoroas. One never finishes organizing, because you need organization in order to build, and then you must be organized in order to watch over what you have built, and that’s how it goes, that is what it means to be organized. That is what is necessary so that the same exploitation of people does not come back, like today men and women are exploited, as well as those who are not men or women. So that the people take on the task of governing themselves. This requires organization. Organization is made of communities, women, men, and otroas. Some people think that we are an organization made up of indigenous people or of Mexicans, but we are not. 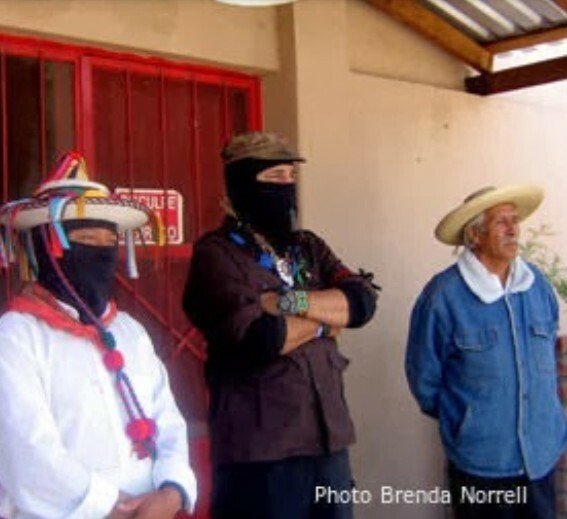 We are an organization of Zapatistas, indigenous and non-indigenous, just as we have seen here in the act of paying homage to two Zapatista compañeros. We are in Mexico because this is where we happen to be, it is our geography. Just like those who struggle for the freedom of the Kurdish people are there because that is where they happen to be. Just like everyone is where they happen to be, like the Sixth in Mexico and across the world, they are in the places that for whatever reason correspond to them. That’s why we talk about the geography of each of us, the corner of the world where each of us rises up, rebels, and struggles for freedom. Here what needs to be made clear is what it means to be a Zapatista. Because it’s not about showing off but about working, organizing, and struggling in silence until their final consequences, that is, it is about theory and practice. Putting on a ski mask does not make one a Zapatista. Rather, organizing oneself and destroying the capitalist system does. Simply saying, “I am a Zapatista” does not make one a Zapatista. Rather, deciding to struggle until death does. Speaking about Zapatismo does not make one a Zapatista. Rather, working collectively with the organized communities does. It is not being a Zapatista to take up the struggle when it’s in fashion and put it aside when attacks by the bad system cause suffering. Putting on a uniform—disguising oneself, as we say—in order to hand oneself over to the bad government does not make one a Zapatista, because a Zapatista never gives in. Saying that one is an EZLN commander and pretending to dialogue [with the government] in order to get paid in money and material projects by the bad government does not make one a Zapatista, because a Zapatista never sells out. Searching for and working under those who want a government post, pay, and who only struggle every six years or whenever the market for official posts [elections] rolls around again does not make one a Zapatista. A Zapatista struggles for total change; they struggle all their life and do not give in. That is, their thoughts do not shift with the trends or with whatever is convenient or according to whatever color is shining brightest in the marketplace. Trying to have it both ways, to be a [political] party-follower and a Zapatista does not make one a Zapatista. Because the party-follower wants to change the color of the ruler. In contrast, the Zapatista wants to change the entire system, not just one part but all of it, so that the people rule and nobody rules over them. One is not a Zapatista because they are never scared. One may have fear sometimes but control it and continue to struggle. One is not a Zapatista if they have a lot of rage but no organization. Rather, one must organize with others and with a lot of dignity. Who gets to say when you become a Zapatista? The people. Who gets to say what makes a Zapatista? The people. Who gets to say when you cease being a Zapatista? There isn’t anyone who says “you’re done.” Rather, one must continue to struggle until death to fulfill the sacred duty to liberate the exploited, and even after death you continue in struggle. This is why we are having this homage, in order to remind ourselves and all of you that, even if death comes in an attempt to convert us into the forgotten, we continue to live in the people, in the struggle, for the struggle and for the struggle of the people. That is how life continues on and wins—and death comes to an end and loses. [i] The text uses “decididos, decididas, decididoas” (decided or decisive) and “puestos, puestas, puestoas” (willing and ready) to give a range of possible gendered pronouns including male, female, transgender and others.